Monday morning dawned in New York City yesterday as it so often does these days: with a total MTA meltdown. The problem this time came about because of a year-long project to fix a stretch of tunnel under 4th Ave. about which the MTA forgot to tell riders and somehow messed up the GO. Thanks to a typo, the D, N and R were all running local and wooden plywood formed a surprising barrier on the express tracks. 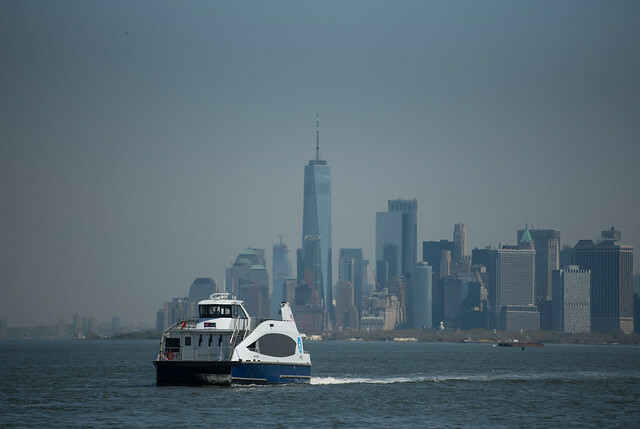 As complaints on social media piled up and no one knew what was happening, riders flocked to any other possible route — ferries, Ubers, whatever they could find. Later in the day, the MTA determined that a typo caused the meltdown, and Aaron Gordon did a deep dive into the mess that was. As Gordon discussed, because the work order identified the wrong signal as the end point of the construction zone, D trains were routed onto the local tracks, and the entire 4th Ave. line south of Atlantic Ave. was thrown into disarray. Furthermore, since Transit had scheduled this work as a long-term change, the internal communications staff didn’t realize it required special word to passengers in the form of station posters and announcements. Thus, the powers-that-be at Transit simply didn’t know they needed to make an effort to bring word of these service changes to commuters during rush hour on a Monday morning. But happen again it does time and time again. As Dave Colon detailed at Curbed (while linking to this post of mine on this very topic from 2011), the MTA constantly fails at communicating basic information about subway delays. As Colon noted, Transit’s twitter account had no update on the issue until 9:17 a.m., at least 40 minutes to an hour after initial reports started trickling in. No one anywhere knew what was happening, and this lag in getting information to the public is a near-daily problem these days. Now, Monday’s delay was a particularly bad one, but this a long-winding way of getting to another point: Monday’s issue isn’t that rare and is illustrative of declining reliability of subway service and a main driver behind the alarming multi-year dip in ridership I charted last week. Following the release of the raw numbers, during the MTA Board meeting last week, agency executives presented a deep dive on ridership trends. What they unveiled wasn’t surprising: Subway ridership is on target for another two-percent dip this year, and the biggest declines in weekend ridership are from the hours of 9 p.m. to 5 a.m., not coincidentally when service gets less frequent and more likely to be plagued by track work-related changes. It’s hard to find good news in the MTA’s report. The only time ridership has steadily increased has been in the hours between 5 a.m. – 7 a.m., and while the morning rush is still above 2014 levels, by the end of this year, ridership in the 22-hour period from 7 a.m. – 5 a.m. will be at its lowest in six years. Overall, the biggest declines are in the Bronx and Queens, with these boroughs seeing subway ridership fall by 6 percent and 5 percent respectively this year. Not coincidentally, again, the MTA notes that growth in the usage of for-hire vehicles — the Ubers, Lyfts and Vias of the world — increased markedly in 2017. Growth in FHV usage was 13 percent last year as 63 million more riders used for-hire vehicles in 2017 than in 2016. That’s a larger increase than from 2012-2016 combined, and when combined with the 199 million bike and ferry rides (and the corresponding 6 million rider increase last year), this increase is a one-for-one match with the 69 million rider decline in subway service. So is Uber responsible for the MTA’s ridership dip? That is what MTA Chairman Joe Lhota seems to want the city to believe. As he said last week in response to a question to Dan Rivoli of The Daily News, “Some days, I drink Coke, and some days, I drink Pepsi.” It’s hard to read this as anything other than an attempt to blame personal choice and forces outside of the MTA for the decline in ridership. To me, though, this is both a gross misreading of the situation and an inverting of the cause and effect. The cause of the MTA’s ridership declines isn’t an increase in Uber use; rather, the effect of the MTA’s declining service reliability is an increase in the use of for-hire vehicles. These ridership declines are worrying trends. The spiral will continue to send those with means out of the subway system while New Yorkers who can’t afford alternate travel are left with an unreliable system that costs them time and money in delays and lost wages. The MTA should recognize that the cause is not Uber but rather the service, and Monday’s communications and travel meltdown was just another sign of the depths of the transit crisis. After a few months’ delay and some gentle nudging on social media over the past few weeks, the MTA this month finally released detailed ridership figures for 2017, and it’s not hard to see why the agency delayed releasing these numbers, as they usually do, in May. In short, 2017 was not a good year for the New York City Subway (and 2018 is shaping up to worse). The decline echoes with ramifications well beyond the confines of New York City Transit’s budget projections. Let’s dive in. We’ll start with the bad, and the bad is pretty bad. Following years of unreliable service and constant subway disruptions, ridership dropped for the second consecutive year, and the total 2017 subway ridership was 1.727 billion, down by nearly 30 million riders from 2016. Last year’s figure is still historically high, but it’s the lowest annual total ridership since 2013 when the MTA recorded 1.707 billion passengers. The picture isn’t much prettier this year as, through May, average weekday ridership was down around 1.6 percent and average weekend ridership is off last year’s pace by nearly 6 percent. It’s very likely that 2018 will see the lowest annual subway ridership total since 2012, and this will represent the first four-year decline since 1988-1991 when a recession and rising crime rates led to the ridership decline. To me, this decline represents a problem. Crime in New York is at historic lows, and the city’s economy and job market are strong. All leading indicators suggest that subway ridership should be booming, not cratering. But it’s not, and it’s worth pondering where these trips are going. By and large, the granular ridership figures show that the decline is generally concentrated in the off-peak and weekend slots. Anecdotally, more New Yorkers simply aren’t leaving their neighborhoods via subways on the weekend, and the city’s economy will be worse off for it. It’s also safe to assume that some people will rely on bikes and bike share while others will use for-hire vehicles or private automobiles. Thus, as subway service grows less reliable and ridership declines, the streets will become more clogged with cars (and the congestion and air quality will be worse). This is not a positive downward spiral, and it’s one with which city politicians should be concerned. To make matters worse, this decline in total annual subway ridership comes after the MTA spend a few billion dollars to open up the three new stops along Second Ave. (and a few years after the 7 line extension opened). Thus, ridership is declining in spite of more revenue-service track miles. Even though the subways are still crowded — after all, 1.727 billion is still a very high figure in recent NYC history — the trend lines are all trending in the wrong direction. Andy Byford’s plan to rescue the subways becomes more important in this light. But the news isn’t all bad, and in a roundabout way, we return to the Second Ave. Subway. As I mentioned, the 2017 numbers are the first reflecting the new service, and riders on the Upper East Side are enjoying the benefits. The three new stations along 2nd Ave. combined for over 20 million riders, and the Q’s shared station with the F at Lexington Ave.-63rd St. saw a 25 percent jump in station entries. With hospitals nearby, 72nd St. and 2nd Ave. is already the 40th busiest subway station in New York City. Take a look at how ridership numbers across the Upper East Side compare year-over-year, and you’ll see the full impact of the 2nd Ave. Subway. For now, though, the subways are still crowded, but less so. That “less so” part should scare everyone thinking about the long-term successes and challenges facing New York City. The picture slowly coming into focus isn’t a pretty one if ridership declines aren’t reversed soon. An MTA prepared for increasing ridership, and perhaps an MTA that had noticed trends in the late 1990s and early 2000s and anticipating increasing growth, would have built demand into the system. A modern signal system in place before the current one started to completely break down would have allowed the MTA to ramp up service as ridership increased, but instead, we have a system weighted down by numerous signal timers that limit both train speeds and system capacity, thus leading to overcrowding that can further slow down trains. As I said, it’s a symptom and not a cause. …MTA board members on Monday will see the new way that delays will be tracked and tallied, which is still a work in progress. The most significant change will be the ambiguous “overcrowding” category, which became the most commonly cited reason for late trains that effectively blamed the riders for suffering subway performance. A new “operating environment” category will now cover many of the overcrowding and unassigned mystery delays. While seemingly vague sounding, these metrics will have teeth behind them. As Rivoli reports, “operating environment” delays will include delays due to signal timers, and the “right of way” delay category will be axed in favor of one that specifically identifies delays due to failed signals and associated repair work. Much of these changes were driven by Rivoli’s reporting earlier this year when he detailed how the MTA hid the true causes of delays in the “overcrowding” category, and some increased transparency is much welcome. On the surface, this isn’t a move with a direct impact on most riders. New Yorkers don’t really care why their trains are delayed; they just want to know that fewer and fewer trains will be delayed in the future. That is, however, something the MTA hasn’t been able to promise of late. But this granular level of delay information gets Transit on the right track toward combating delays. It’s easy to ignore delays due to “overcrowding” if you think overcrowding is the root cause of the problem. It’s harder to ignore delays due to signal timers when you know signal timers are the cause of the delays, and it’s easier to combat these delays by identifying and eliminating those signal timers that aren’t absolutely necessary. These are of course baby steps, but they’re the right baby steps that Byford has to force Transit to take so service can get better in the future. He’s still saying and doing the right things, and as long as he has political cover to act, slowly and surely, he can work the subways out of this crisis. It’s going to be a long ride though, but at least it’s not one delayed by you and me and the 5.6 million other subway riders every day. In about a week or so, Andy Byford is going to reveal his big NYC Transit subway rescue plan to a public anticipating a Big Idea. Byford was brought in specifically to build this plan and execute on turning around the struggling subway system. It won’t be easy, and one of the major obstacles in Byford’s way is New York City Transit itself. The agency often can’t seem to get out of its way, and many of the current problems with fast and reliable service are self-inflicted. One of the biggest problems, as I discussed in mid-March, are signal timers slowing down service throughout the city. These timers were a reaction to the 1995 Williamsburg Bridge crash, and in March, Aaron Gordon of the Village Voice explored how the MTA did not understand the effect the timers would have on capacity and service. A study nearly 20 years after the fact betrayed the MTA’s problems. “The 2014 study — the first time the authority had attempted to analyze the impact of any of the revamped signals, using its improved data system — found 2,851 lost total passenger hours per weekday could be attributed to thirteen modified signals alone. That was almost double the predicted impact; for comparison, the modifications of  thirteen signals alone created 5 percent as much lost time as that experienced by riders of the entire London Underground on its average day,” Gordon reported, based on internal MTA documents. The analysis stated that if the M.T.A. had known the signal changes would reduce the number of trains able to run on congested lines, they would not have been made. But the damage was done. After the signal changes, two fewer trains could run on the southbound 4 and 5 lines hourly, forcing the thousands of passengers those trains would have carried to squeeze into already crowded cars. Across the entire system, more than 1,800 signals have been modified since 1995. To me, this graphic is the biggest indictment of all. These stations in Lower Manhattan are absurdly close together and largely along straight tracks. A train operator on a downtown 4 or 5 train can see each station from the one before it, and yet, the signal timers add 15 seconds per trip from Fulton St. to Bowling Green. Over the course of a line, this adds up to a significant constraint on capacity, and delays due to “overcrowding,” an excuse the MTA has hidden behind for years. The success of Byford’s plan will hinge on how he treats and responds to these signal timers. It’s guardedly good news that he has, as Jon Weinstein said to Pearce, “asked for an analysis of the impact of signal modifications on subway schedules.” But it’s not enough to ask; he has to respond and fix the problem (without sacrificing safety). But more on that — and the new flagging rules The Times noted — in a follow-up post.